In the late nineteenth and early twentieth century, the German intellectual world was challenged by a growing distrust in the rational ideals of the enlightenment, and consequently by a belief in the existence of a radical ‘cultural crisis’. One response to this crisis was the emergence of ‘Life Philosophy’, which celebrated the irrational, expressive, instinctive and spontaneous, while rejecting the rational, conscious, and logical. Around the same time and place, Zionist thought crystallized. It discussed issues like the ‘Jewish essence’, the creation of a new Jewish person and a new Jewish community, return to the Jewish homeland, and the negation of the diasporic way of life. 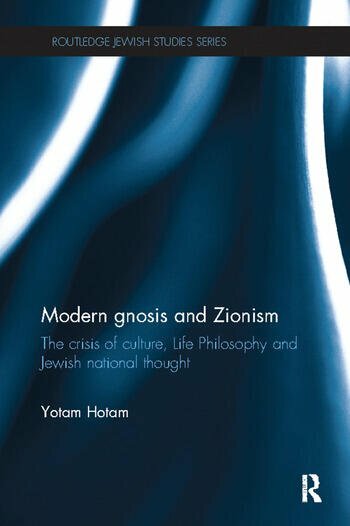 This book explores the connections between Zionism and Life Philosophy, and argues that Life Philosophy represents a modern secularized version of gnostic dualism between God and world, and that this was a particular secular impulse that lay at the core of the Zionist political mission. Consisting of two main sections, the book first shows the manner in which Life Philosophy should be understood as a modern, secularized, gnostic theology, before concluding by discussing its political Zionist interpretation. Drawing on published works of a wide range of thinkers and intellectuals, alongside a variety of unpublished materials, this book will be welcomed by students and scholars of Jewish studies, the philosophy of Judaism, and religion and philosophy more generally. Yotam Hotam is an Assistant Professor at the Faculty of Education at the University of Haifa, Israel.